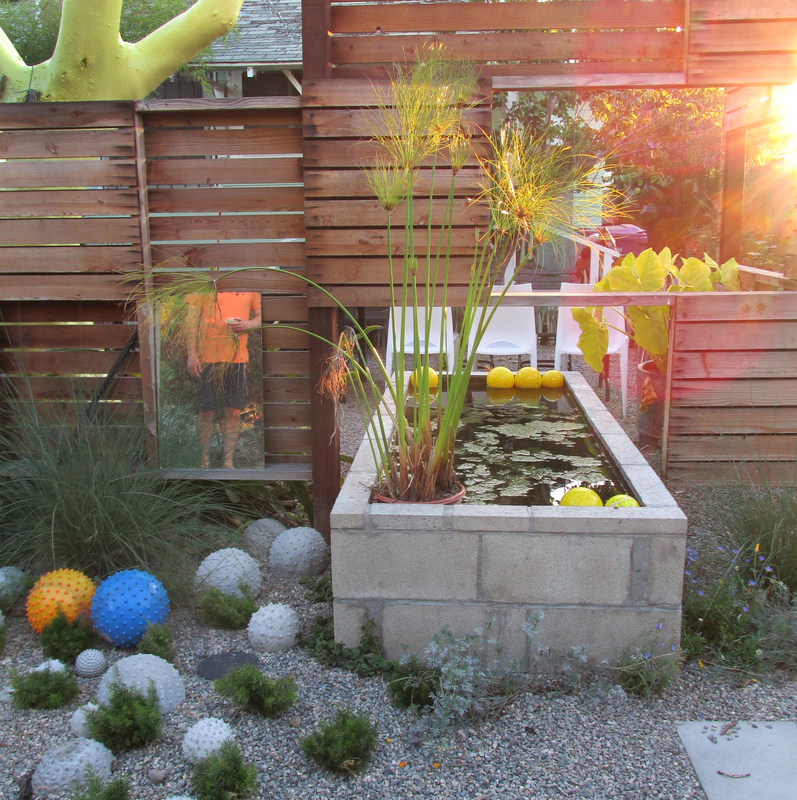 A timber window wall plays peek-a-boo with the remains of the daylight while concrete diatoms and spores nestle into a gravel bed; smooth yellow orbs bob in a trough-like water feature and the designer himself appears in a mirror. Fear not, his missing head appears at the end of the post. Rounding the wall we take in the recently painted trunk of a large tree. Stripped of bark, its smooth surface and pale hue — the color of beaten egg yolks — heightens its sculptural presence in the space. 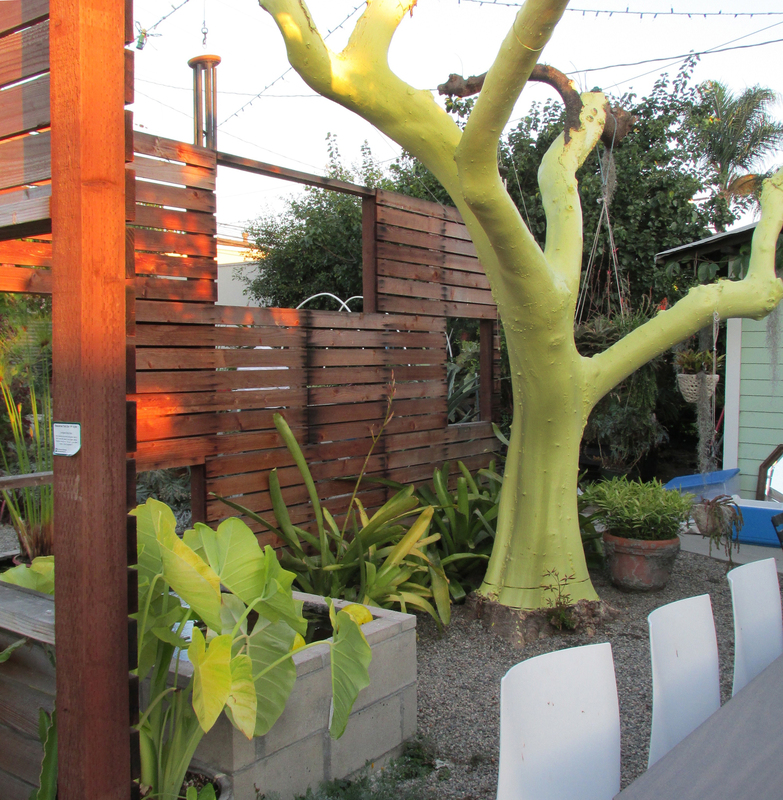 A functional sculpture, the yellow tree’s branches serve as sturdy arms from which to hang containers overflowing with succulents and other plants. 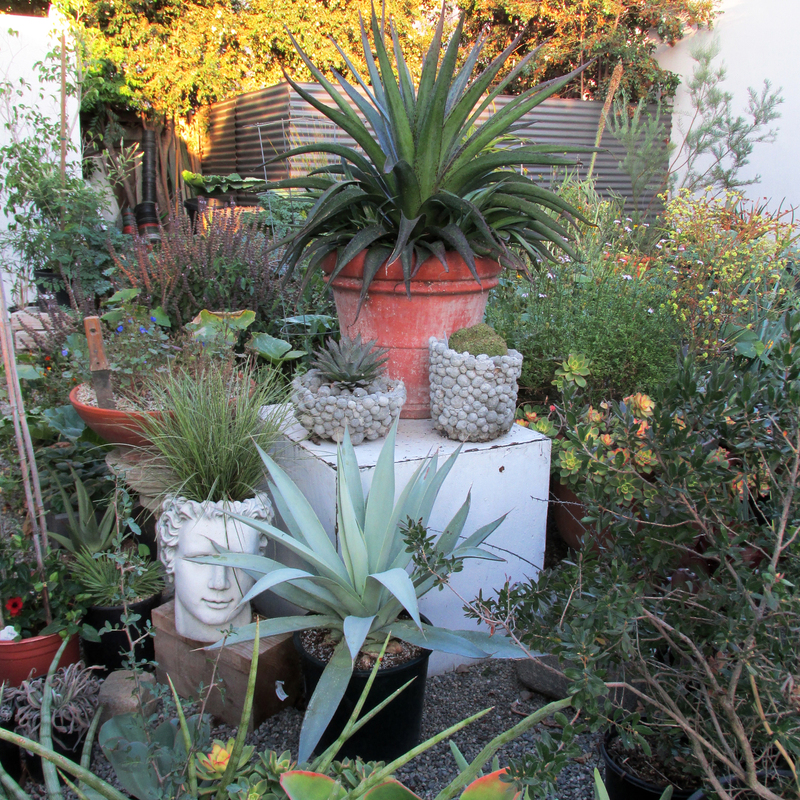 The aloe at right foreground, is amazingly thick and appropriately named Goliath. Dustin’s propagation area teems with all types of plants, some in decorative pots. The succulents, of course, are standouts for me; the gorgeous specimen in the center, foreground, was most beautiful. Its pale gray-blue color and unusual texture reminded me of fine suede. And speaking of unusual standouts, the garage wall is crawling with what at first appears to be deflated lungs, or maybe an extraterrestrial’s naughty bits. Actually the flowers of an Aristolochia gigantea vine, it’s both beautiful and bizarre. 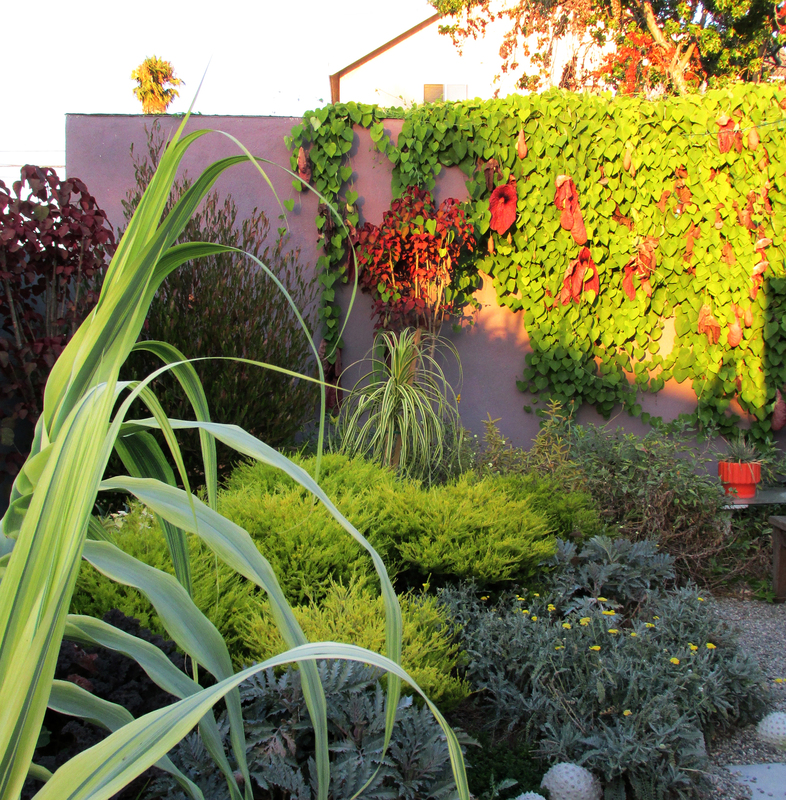 Dustin’s garden is a wonderful example of the power of color. I love the visual energy provided by dark-hued plants in deep blue, green and purple next to others in chartreuse, lime and acid yellow. 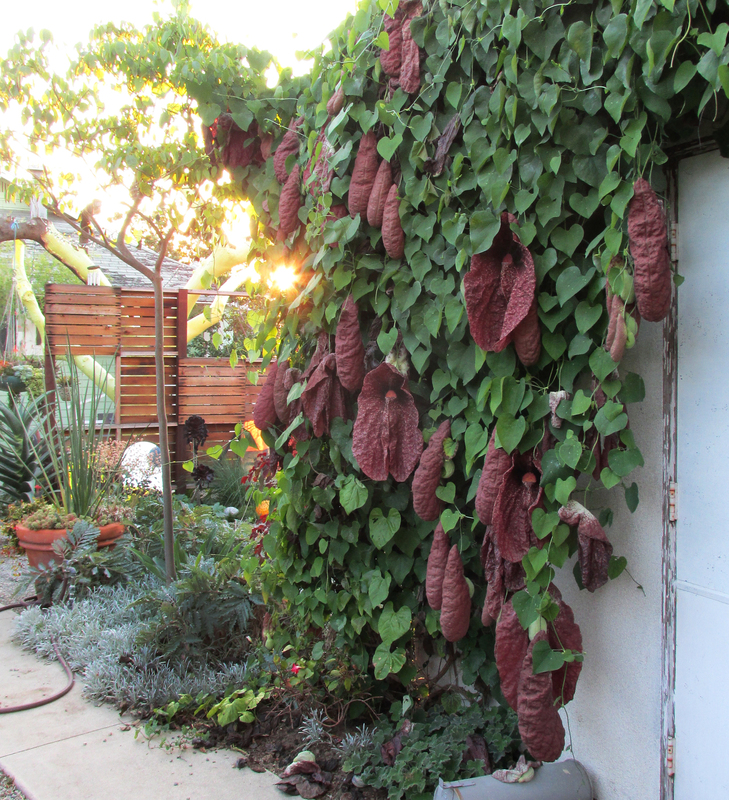 The garage wall’s plummy shade heightens the deep reds of nearby trees and those astoundingly weird Aristolochia blooms. Moving to the front yard we can check the progress of some older, favorite elements of the garden. 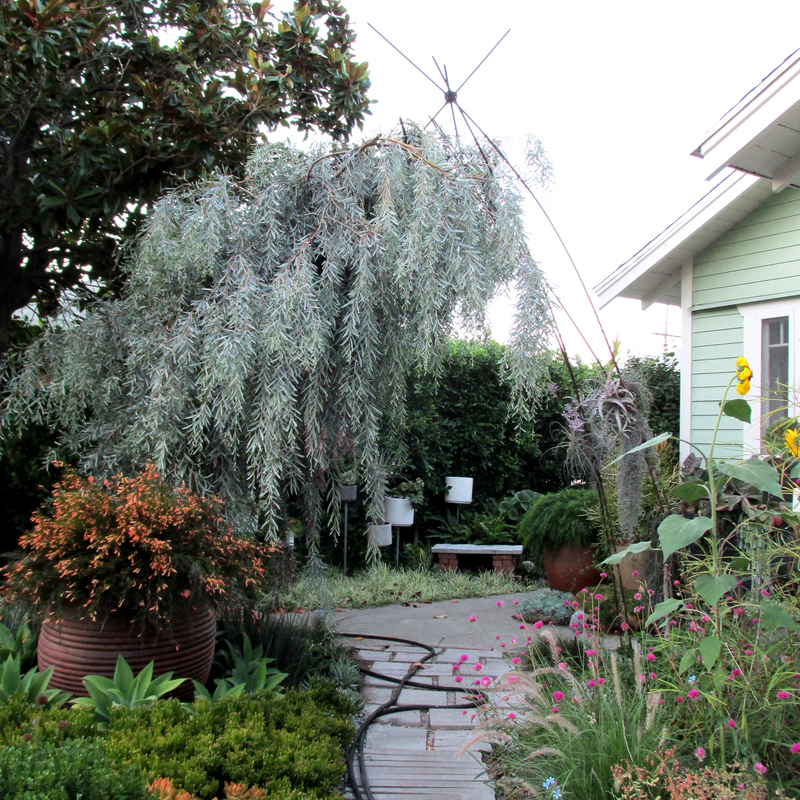 His rebarbor (rebar + arbor) is almost completely obscured by a tree’s lovely gray foliage. Almost hidden in the background, a selection of Gainey containers are perched on metal stands. 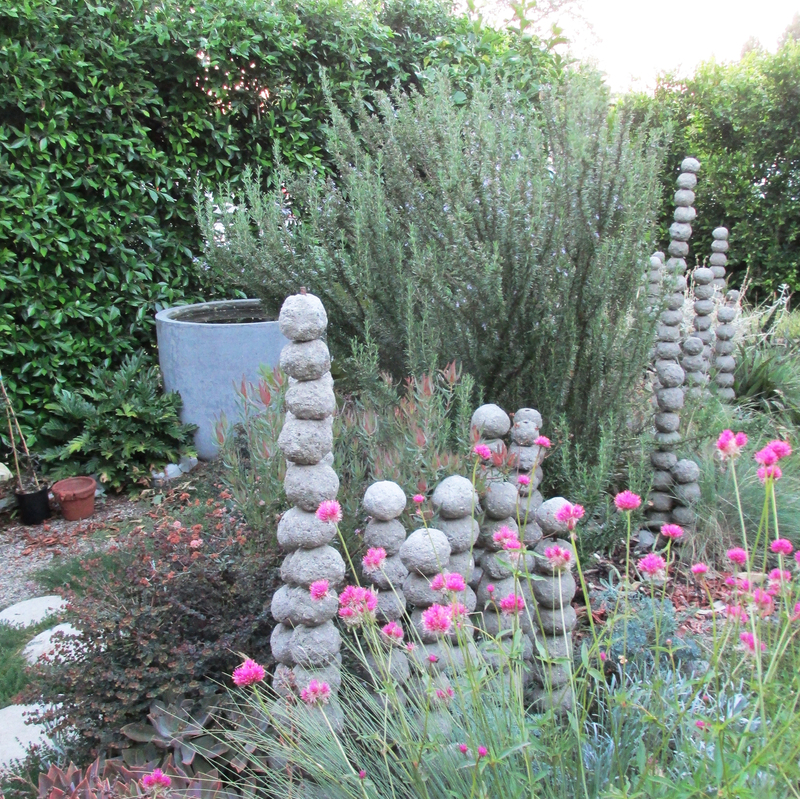 Skewered hypertufa “meatballs” dot the landscape, holding their own among mounds of colorful shrubbery. A huge water bowl stands coolly behind. I love these containers near the front steps; their combined foliage make me think of the line to get into an ’80s new wave dance club. 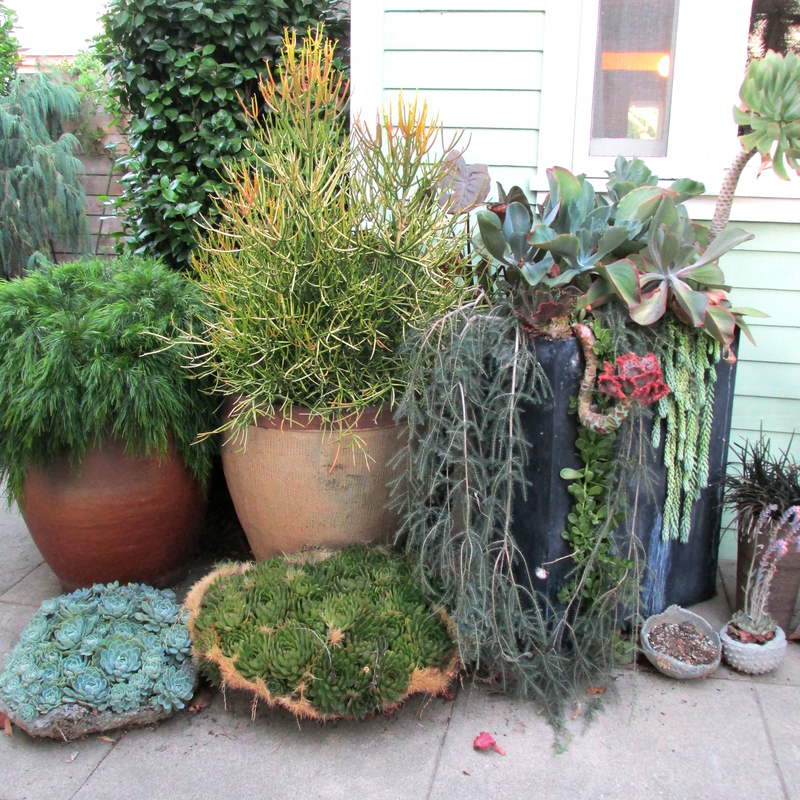 Large succulent clumps (lower left) are planted in containers so organic-looking they appear not to be potted at all. Dustin’s garden rewards the viewer who takes the time to look closely … fine foliage and subtle color mixes are easily missed, otherwise. Tour finished we sat down to a simple, delicious meal at the outdoor table. Denise, of A Growing Obsession blog, was also present, and the conversation was quick and lively. As evening’s curtain came down we found lots to laugh about … Dustin regaled us with tales of his travels and we discussed our respective heritages; German figured into Dustin’s makeup, hence Gimbelgarten seems perfect. 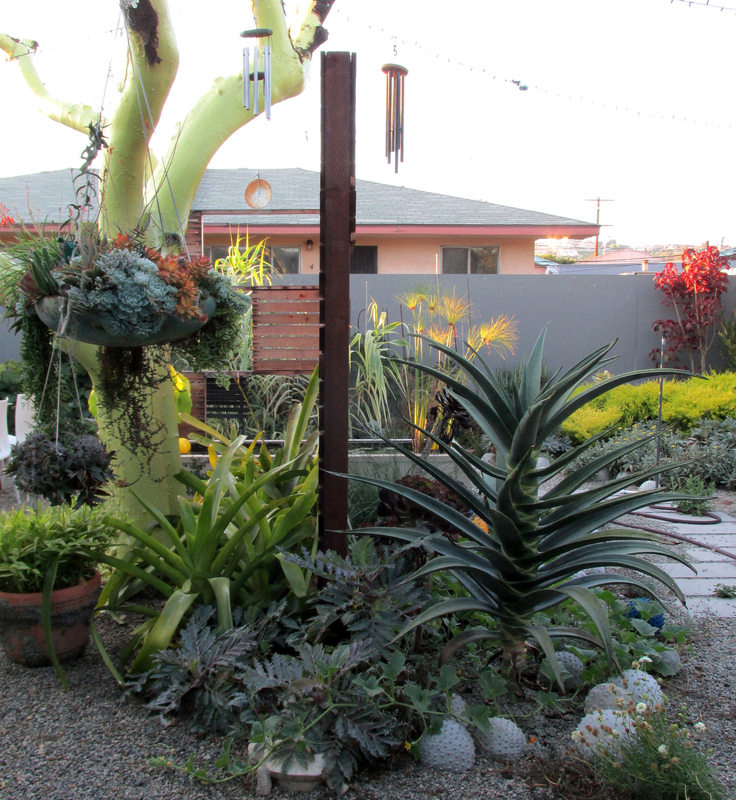 Also perfect, if hilariously jarring, were sudden bursts of Norteño music from next door, the manic accordian reminding us that this amazing garden is set in Long Beach’s barrio. Evening turned to night and it soon grew cold; our perceptive host supplied hoodies and fine merino wool scarves since we’d dressed for Riverside’s warmer nights … a delicious tart of fruit and marzipan from a local bakery we loved appeared and soon it was time to go. A delicious evening on many levels, it left me pining for the days when we lived in this beach city and pain wasn’t my daily companion. 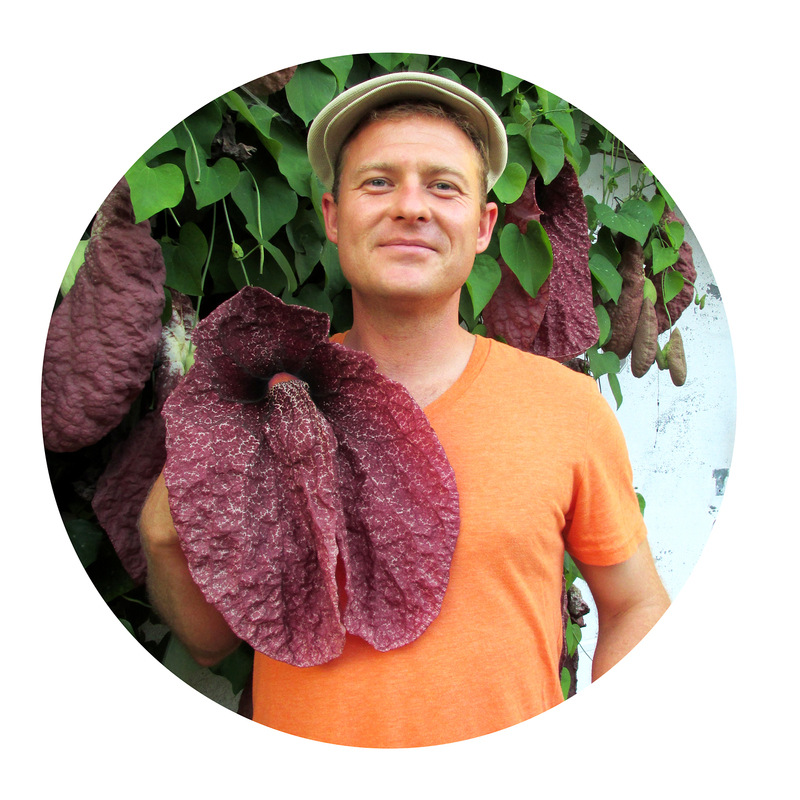 Here’s our host and friend: A man who wears his mutant flora proudly, who knitted those fine woolen scarves, who will have cooked for a certain Martha Stewart not once but twice, who designed this lovely garden, Dustin Gimbel. Visit Dustin’s blog, non-secateur, by clicking here. Read my earlier post on Dustin’s garden by clicking here; it’s changed a lot since then. What talented friends you have. It must have been a joy to watch this garden mature.. Thank you for this post Reuben, it is wonderful to see Dustin’s garden through your eyes. I devoured Denise’s and Annette’s posts but yours is an entirely different look. I hated the part about your pain though…I was hoping that had passed. ET’s naughty bits???? LOL. That is a really unusual flower. WOW, what an amazing garden. You Californians have access to some great succulents. I am so jealous. Thanks for sharing your ideas and your friends. You’re welcome, Val … I don’t get out much due to my spinal issues but I couldn’t miss this visit to Dustin’s. I feel lucky being a succulent lovin’ Californian, too! omg, the size of the flower !!!! Dustin is the MAN! what great expression of his over the top style and character! coolest thing ive seen in a while..does he have a blog?